A new short film by Excel Entertainment and T.C. 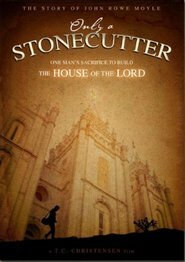 Christensen has been released entitled “Only a Stonecutter: One Man’s Sacrifice to Build the House of the Lord.” The film tells the story about John Rowe Moyle and how for 20 years he walked 22 miles from Alpine to Salt Lake to work as a stone mason on the Salt Lake Temple. He endured this rigorous routine even after losing his leg in an accident. Several general authorities have told this story, including President Uchtdorf in the Priesthood Session of the most recent General Conference (October 2008). We have also recounted this story previously as told by Elder Holland in the April 2000 Conference. As a capstone to Br. Moyle’s work on the temple, he is the one who chiseled “Holiness to the Lord” on the eastern façade. The film is 14 minutes long and available at Deseret Book and likely wherever LDS items are sold. A short preview video clip is below.